​soaking in warm water ​from 20 - 60 minutes. This paint WILL wash out of ALL kid's School Clothes. Until now it has been thought to be impossible for a full range of colourful school paints to completely wash out of kids' clothes and school uniforms. Parents have been complaining for years about residue staining left on favourite clothes from paints used at school. But FAS Total Wash changes all that as this educational paint is guaranteed to totally wash out of clothing quickly and easily. In the past with other brands of school paint, clothing would have to be washed and rewashed, using strong stain removers, special soaps and even soaking in strong bleach for days. But the staining still remained and will not budge. 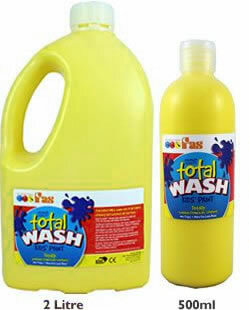 FAS Total Wash takes all the work out of washing and more importantly also the staining. Paint splashes left on clothing over a period of time can still be removed weeks later on first wash.
​Traditional machine washing with soaps suitable to the fabric will also work just as effectively. This paint is non-toxic and completely safe for children. Best suited for pre-school and primary schools for brush application. Ideal for non-permanent posters, ticket writing, finger painting and general art and craft work. Can be applied straight from the bottle. It won't separate or spoil and there's no shaking or stirring required. Apply by brush, sponge or fingers. Brushes, hands and painted surfaces can be washed up with warm soapy water. Some colours in certain conditions may linger on hands but will wash up. Some painted surfaces may require a surface cleaner. Do not pour excess paint back into the container. 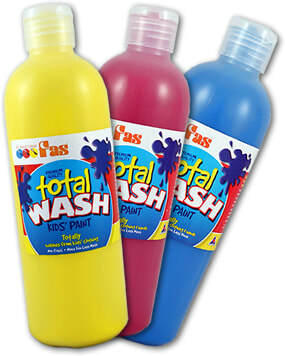 "Paint Stain Blues are Gone"
"No More Throwing Away Stained Clothes"
​Pumps available separately for 2 Litre. Rinse any excess paint from clothing. 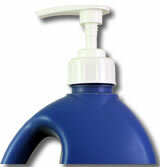 Soak in water or machine wash in warm water using a detergent suitable to the fabric. This paint also washes out of fabrics just by soaking in warm water from 20 to 45 minutes. This product does not contain dairy/casein, egg, gluten, soy or peanut products, by-products or derivatives. This product does not contain latex materials or animal derived ingredients.